Part of the fun in DeLorean ownership is getting together with other owners and working on our cars. From basic maintenance to major repairs to simple detailing, attending a tech session is always a learning experience and a great way to help each other. 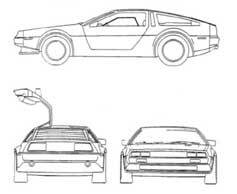 When the Back to the Future film came out in 1985, featuring DeLorean's namesake car, John DeLorean wrote a letter to Bob Gale, thanking him for immortalizing the car in the film. The letter can be seen in the special features of the Back to the Future DVD release. Copyright (c) 2009 Website Name. All rights reserved.